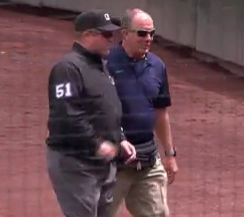 1B Umpire Marvin Hudson suffered a leg injury while tracking a foul ball, and temporarily left Sunday's game as a result. With two out in the top of the 1st inning of the Angels-Mariners game, Angels batter Albert Pujols hit a foul fly ball past first base and onto the warning track in foul right field. During the play, Hudson appeared to twist his knee while turning toward and running into foul territory. Crew chief Jim Joyce moved over from his second base position and served as first base umpire, alongside 3B Umpire James Hoye and HP Umpire Gabe Morales, until Hudson returned to the game later on in the contest.